According to Quentin Kopp, chairman of the California High Speed Rail Authority, the peninsula line could be operational in 2015. What will that look like where you live? We can try to draw the big picture from the CHSRA's Environmental Impact (EIR/EIS) documents for the Bay Area, published in May 2008. There's lots of detail in the report and appendices. 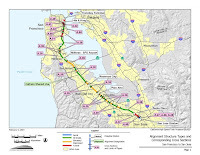 A map of the peninsula from a 2004 EIR/EIS document (at right) summarizes where the peninsula tracks are planned to run at-grade, in tunnels, or in elevated or sunken sections. The CHSRA also provides a more recent, interactive Google Map. These maps are clearly preliminary, as anyone with detailed local knowledge will attest; they will be fleshed out in the next few years during the detailed engineering phase. HSR plans call for building most of the new peninsula tracks at ground level, or in elevated / sunken sections as labeled in the above map. Cross sections of these configurations are provided, with the most common shown below. Ground level 4-track section. Caltrain already has these (minus the overhead wires) in Brisbane, Redwood City and Sunnyvale, to enable Baby Bullet service. The ROW width is about 100 feet, including service access roads used mostly for trimming vegetation. This configuration is labeled A.38 in the map above. Elevated 4-track section. Where space is available, this can be built on a wide berm. Where space is not available, retaining walls are used as shown in the figure, keeping ROW width to within 75 feet (with external access presumed). Labeled A.39 in the map above. Sunken 4-track section. The ROW width is within 75 feet (with external access presumed). Labeled A.39 in the map above. 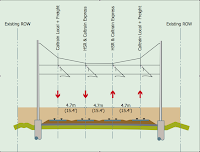 Caltrain has some additional dimensioned cross section drawings in Chapter 2 of their electrification EA/DEIR (see in particular Figure 2.3-3). Expense: anything involving lots of earth moving and pouring of concrete will automatically cost lots of money. That is certainly bad for the taxpayer, although the large construction firms that design these projects sure don't seem to mind. How will the arrival of HSR alter existing Caltrain tracks, stations and crossings? In future posts, this blog will focus on some unique situations at various locations on the peninsula. Another issue is constructability. Remember Caltrain will continue operation throughout the construction period. Building a 4 track rail bridge would require multiple phases of construction. This makes the construction cost much more expensive by having to build something that would be torn down, and then make room for another structure. Hi Andy, that's a good question and an important issue. Keeping Caltrain running while the grade separations were built in San Carlos and Belmont was pretty messy, and will be the subject of a future post. The HSR docs have a basic operating plan (how many trains per day). On an unrelated subject, please drop me a line: my first name at tillier dot net. I have something I've been meaning to send you, but I don't have your e-mail address. (1) the 4 tracks are shared to SJ. Beyond there, Caltrain has no plans to electrify. The HSR tracks to Gilroy and beyond will be separate from Caltrain, if I recall. (2) the schedules would probably be coordinated such that HSR has a straight shot. (5) Caltrain electrification will probably have to be redesigned, and much of the track rebuilt / realigned for higher speeds. The track is currently only good for 80 mph. (6) EMUs are the way to go because they provide better start/stop performance. The gallery junk heaps will be scrapped, and the heavy FRA Bombardiers can go serve Gilroy. The only HSR I've ridden on is in France... which from Paris to Marseille and Strasbourg to Paris is really nice and fast. Between Paris and Bordeaux is slower (according to random online map because only half the way is high speed line). Is the CHSR going to be comparable to the French services in speed per distance? I agree with getting the best speeds for the money but I think there needs to be an open process of the trade offs of speed and price. I used the Google Map miles between the two since track miles seem like a bad way to calculate... I suppose the numbers are about the same... although CA seems to fall a little short of the newer, faster TGV tracks probably in part because they are trying to incorporate more cities making some track miles significantly greater than Google driving directions. So you think Caltrans will go the expensive but ultimately better solution for the future and scrap every part of the current trains but move the baby bullet trainsets to the SJ to Gilroy route and go and buy completely new bilevel EMU units? Sounds like a better solution to me. It would be hard to simply add electric locomotives to the current crap gallery cars. The newer all EMU trainsets would allow faster service with much higher comfort with less maintenance in the future.